On this page you can find links to some related websites. If you are undertaking research, please bear in mind that different websites may have different conditions for using their content. You can check ours here. Do you have a website related to Sir Hans Sloane or his publications, life or letters? Please contact us if you would like your site to appear on this list. Ficus maxima. Sloane’s label is at the foot of page 79 verso in volume 7:80. It refers to the pencil sketch from life on this page. The pencil sketch was inked by Kickius (not signed). There is no specimen of this plant. 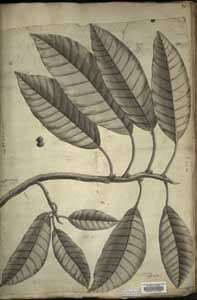 (Entry by C. D. Adams) Source: Natural History Museum, The Sloane Herbarium, ID 970. Much of the Sloane correspondence is available on microfilm. The Adam Matthews guide also has a list of all the correspondents in the collection. You can search for individual volumes (e.g. ‘Sloane MS 4038’) to look at the correspondents and order of letters in each volume. Fancy a look at the 8695 objects at the British Museum that belonged to Sloane? Exciting new project at the British Museum and University College London that aims to understand the structure of Sloane’s catalogues and collections. This project brings together the printed books that once belonged to Sloane, some of which were dispersed far beyond the British Library. Given Sloane’s longstanding participation in the Royal Society, particularly as Secretary and President, it is not surprising that he appears frequently in the Royal Society archives. You can explore the botanical specimens of Sloane’s herbarium, as well as learn about how they have been preserved. A project to explore the possibility of digitally reunify Sloane’s collections that are now held at the British Library, British Museum, and Natural History Museum. 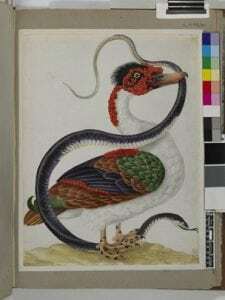 Maria Sibylla Merian, Muscovy duck with snake (ca. 1701-1705). Credit: British Museum, SL,5275.78 . A project about seventeenth-century collectors, many of who overlap with the Sloane correspondence. A Cultures of Knowledge that aims to make the correspondence of the Republic of Letters more findable. There are letters by Sloane listed here, as well as many of his correspondents. The correspondence of Jean-François Séguier, who visited Sloane’s museum and was an occasional correspondent. Letters addressed to and from Carl Linnaeus, which includes Sloane and some of his correspondents. The Alps and the Culture of Curiosity: an online exhibition about Johann Jakob Scheuchzer’s natural history investigations. He was a frequent correspondent of Sloane’s. 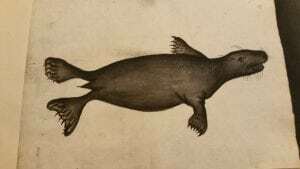 James Yonge sketch of a seal poached by fisherman: Sloane MS 4043, f. 18 (10 December 1711).